Nigel Saunders's YouTube channel The Bonsai Zone has received more than 13 millions views. Nigel Saunders stands in the middle of a jungle. Around him grow ancient-looking trees with gnarled trunks, dense canopies, and lichen-covered branches. One rises out of a rock temple, its roots hugging the crumbling grey stones. But Saunders isn’t looking up at the trees; he’s looking down. Saunders is practising bonsai, the art of cultivating miniature trees in pots. He grabs a spray bottle and goes around his sunroom to give each bonsai a delicate mist of water. “This is my Ficus microcarpa,” he says, kneeling down to spray one that’s sitting on a wooden table. “Check out its aerial roots.” I squat beside him. The tree, maybe a foot-and-a-half tall, has dark-green leaves the shape of spearheads. Roots dangle from its branches, poised to plant themselves in the moist soil of its oval pot. It was Saunders’s first bonsai, the one that sparked his passion twenty-six years ago. He has been caring for it ever since it was a two-inch sprout that he noticed peeking out from under a poinsettia that his office had received one Christmas. “I thought the tree deserved its own pot,” he says. 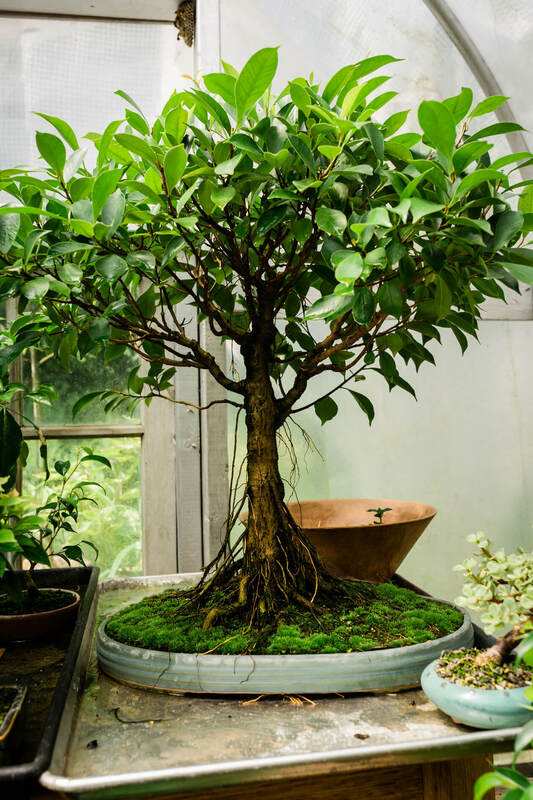 His Ficus microcarpa, also known as a Chinese banyan, is part of a carefully curated collection that has expanded to around 180 bonsai. Saunders is growing a cluster of western red cedars, native to Canada’s rainy West Coast, and kapok trees, commonly found in equatorial forests. He has an apple tree that unfurls white blossoms every spring and a spiky pine from the Austrian mountains. 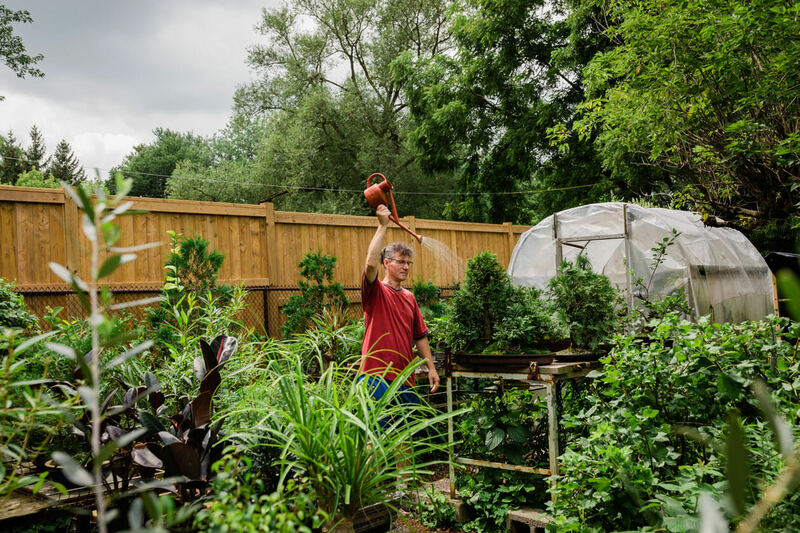 Conifer and tropical, evergreen and deciduous, fruiting and flowering, Saunders has thriving trees from around the world leaf to leaf and needle to needle in his suburban solarium. Saunders shuffles around the cramped room while offering the Latin names for each of his plants and punctuating brief descriptions with spritzes from his bottle. He mists a radiator-style space heater at the base of one wall, causing steam to fill the room and the humidity to spike like a sauna. “And here’s my famous lemon tree,” he tells me, beaming with pride. Saunders points to a spindly trunk with glossy, emerald leaves. It has 1.5 million views on YouTube. He may grow little trees, but Saunders is no typical bonsai practitioner. The art, best known for meticulously shaped specimens kept in pristine botanical gardens, seems a far cry from the scene in Saunders’s crowded solarium, its walls covered in a reflective material that looks like repurposed space blankets. His outdoor garden and greenhouse are not much better, featuring trees in broken pots sitting on makeshift plywood work benches. Saunders is, nonetheless, an expert of the craft. He is also creator and host of one of the most popular bonsai YouTube channels in the world, which he uses to bring this high art to the modern masses. For four years, Saunders had been my bonsai master, despite us never having met. I studied his video tutorials on planting and potting and pruning and created a bonsai of my own. But I couldn’t help but think that I was failing: my tree looked nothing like the intricately and elegantly styled versions that were before me. I had tried to bring the nature that I loved indoors, to capture a sliver of the wild and make it my own. Instead of a quiet and contemplative pastime, however, I found myself tumbling into a miniature world packed with anxiety and stress. Those shapes include formal and informal upright, slant, windswept, and multitrunk. Some trees are intended to appear as forest groves and others to cascade below the level of the pot, as if dangling off a cliff. Some even flower or fruit with marble-size oranges or pomegranates drooping from miniature branches. To be close to a bonsai is to glimpse the minutiae of nature. Saunders’s first bonsai, a twenty-six-year-old Ficus microcarpa. I grew up on an island in rural British Columbia surrounded by imposing nature—big mountains, big ocean, big trees. Not long after I learned to run, I was collecting bees and frogs and grasshoppers and dropping them into glass jars with leaves and moss in an attempt to recreate the grandeur around me. To grow a bonsai—a tree that I could hold in my hand—became the ultimate expression of this fascination. But, as a hobby and an art, it felt inaccessible. The examples I saw appeared inconceivable, grown with styling and caring techniques that appeared fastidious and inflexible—as if I needed decades of study before ever touching a tree. I stuck with houseplants. It wasn’t until the summer of 2014 that I decided it was time to give bonsai a go, sprinkling 100 speck-like tree seeds into a yoghurt container filled with soil. I diligently watered as per the instructions on the back of the packet, and every morning for weeks, I checked for life. Then one morning: green. Dozens of twin-leafed sprouts had erupted from the loam overnight. They were Ficus religiosa, identifiable by their bright green protoleaves the shape of tiny hearts. Just after life arrived, so too did death. One by one, the sprouts turned brown and curled. Amid the rot, however, one thrived, seemingly buoyed by the nutrients of the fallen. When it was two inches tall with a couple of pairs of leaves, I carefully dug my fingers into the dirt and transplanted the fragile seedling to a new terracotta pot. Around 500 bce, Siddhartha Gautama attained enlightenment after sitting under a Ficus religiosa, becoming the Buddha. The tree was undoubtedly tall and wide and leafy, like the millions of its kind that grow across South Asia, where they are known as bodhi trees. The tree that sprouted so optimistically in the sunny bay window of my Toronto apartment probably had similar plans for greatness. I had another idea. The masters of bonsai—part artist, part gardener—twist, bind, break, bend, and manipulate some of Earth’s grandest natural creations to their will. In the wild, a coast redwood can grow as tall as a thirty-five-storey skyscraper; a single banyan tree, with its multiple root systems, can cover a couple of hectares. But as bonsai, these trees are never allowed to achieve their potential. They are living examples of the human desire to conquer nature; we are forcing a tree to grow on a windowsill in a pot the size of a cereal bowl. Bonsai are hubris writ miniature. A bonsai “has two ages,” writes Horst Daute in The MacMillan Book of Bonsai, “its own physical age and that of the tree it seeks to represent.” Achieving this illusion involves near-imperceptible techniques in manipulation. For bonsai that are grown outside of their natural habitats, seasons and weather patterns are often recreated artificially: spraying the trees with water to simulate rain, greenhousing them to recreate the tropics, or forcing them to believe it is autumn by pruning off all their leaves. The result is that bonsai aren’t just little trees, they’re little trees that think they’re big trees. The illusion of time is what makes a bonsai simultaneously real and fraudulent. A tree that is thirty years old may be shaped to appear as if it is 300. One drastic technique involves intentionally killing portions of a trunk by scraping away bark to fabricate dead wood and the appearance of great age. Another is shrinking the size of a bonsai’s leaves to ensure that all of the tree’s elements are in proportion. By pruning a tree at the height of its frenetic summer growth, the tree is forced to use up whatever stored energy remains in its roots to regrow, and as a result, is only able to produce smaller and smaller leaves each time the process is repeated. Some trees do grow old and are passed down through generations of caretakers who govern their growth for centuries. Bonsai is, after all, a hobby that never ends. One of the most storied specimens is a nearly 400-year-old white pine in the National Arboretum in Washington, DC, that survived the atomic bombing of Hiroshima. Others are centuries older and have fetched more than a million dollars. My Ficus religiosa had a long way to go. My tree halted its growth when the temperature dropped during its first autumn and entered a concerning stasis when I didn’t know if it was alive or dead. Bonsai is a challenging hobby for a novice. When you pick up a paintbrush and dabble in watercolours, nothing, typically, is going to die. I obsessively checked my tree’s health every morning, like some arboreal helicopter parent, and fretted over all the ways it could fail—from not enough sun to too much sun, invasive pests to natural disaster. After all, a flood would manifest for my bonsai not as a river breaching its banks but as me accidentally overwatering it one day. Come summer, new leaves began unfurling every week, pushing the tree higher and higher, like a beanstalk. But the key illusion of proportionality was nowhere to be found. It had a trunk as skinny as a pencil and leaves bigger than playing cards. I turned to the books of John Yoshio Naka, the bonsai master who founded the California Bonsai Club in 1950 and who is often credited with bringing the art to the United States. His two tomes, Bonsai Techniques I and II, are considered scripture by purists who fawn over the impressive line drawings of styles, photographs of elaborate trees, and how-to guides on care and cultivation. But the texts, which include complicated descriptions, such as the “Golden section of division,” a method for a perfectly proportioned bonsai, can be hard to follow for a newcomer. Reading these books felt as if I wanted to build a tool shed and was looking for instructions by leafing through a design book by Frank Lloyd Wright. 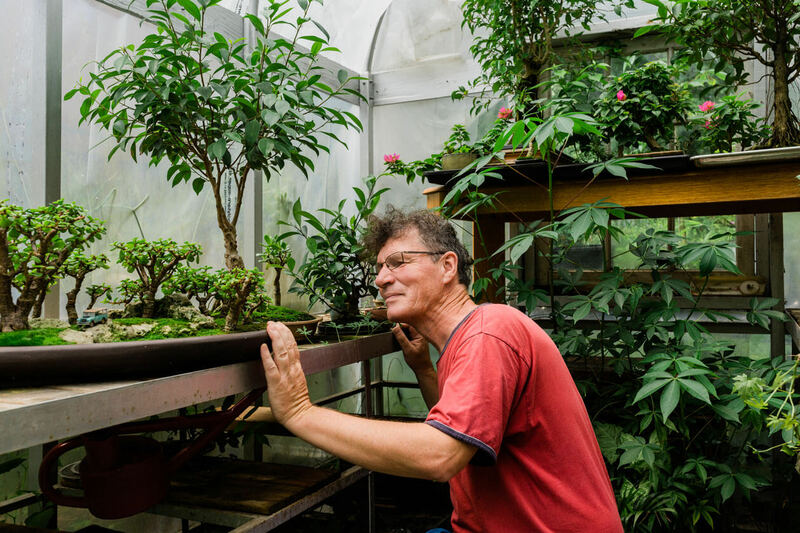 Saunders cares for around 180 bonsai in his home in Ontario. I closed Naka’s books, opened my laptop, and googled, “Ficus religiosa pruning tips.” I clicked on a video tutorial. “Hi there,” a friendly voice said. “Nigel Saunders, for KW Bonsai. Today we’re gonna tackle this Ficus religiosa.” Kneeling in the dappled shade of a backyard was an unassuming, middle-aged man. On a table behind him sat a yellow bottle of Miracle-Gro and the bonsai of my dreams. The little tree had a healthy canopy of heart-shaped leaves, which I instantly recognized, and a trunk as thick as a sausage. Over the next forty minutes, Saunders walked me through choosing the “front” of the tree (the side you want to show); he demonstrated how to remove the tree from its pot, trim the roots, and replant it; and he confidently guided me through pruning leaves. The video was an amateur production, but that drew me in. In one moment, he picked up his camera and zoomed in on the tree, its branches and leaves going out of focus; in another, a white chicken casually walked through the shot. There was no script or clever effects, and there was no formal Japanese terminology (unlike some other pros, he didn’t call his tree’s root base nebari without explanation; he simply called it “the root base”). Saunders presented bonsai not as a lofty, inaccessible art form; it was just a man and his tree. The Ficus religiosa video was one of the first that Saunders uploaded to his YouTube channel, which he launched in 2014. (“KW” stands for Kitchener–Waterloo, a region that’s a couple hours’ drive west of Toronto.) His channel is organized into dozens of playlists containing numerous videos for each tree, allowing followers to track their progress over years. And his casual approach to bonsai has been popular, gaining him more than 87,000 subscribers and over 13 million views. For four years, I doted over my bonsai’s health, cautiously following Saunders’s regular Ficus religiosa updates, until my tree developed a full canopy. At first, every new leaf was a badge of honour, but soon, they represented a problem: Saunders’s trees were stout and proportional—they looked real. Mine, meanwhile, was spindly and, at nearly two feet from root base to tip, looked nothing close to natural. I worried that I’d performed the cardinal sin of growing bonsai: I had let my tiny tree get too big. Paralyzed by fear that I would kill my bonsai—too worried to repot it or aggressively prune it—I realized that I needed help. So I picked up my tree, hailed a cab, and headed to the train station. It was time to meet my bonsai master. On a breezy spring day, Saunders pushes open a gate at the side of his house and leads me into his solarium, where he keeps his tropical bonsai through the winter. With his frizzy grey hair and glasses, plus an outfit of khaki cargo shorts, a red fleece, and Crocs sandals, the fifty-six-year-old looks like some kind of modern wizard who traded his wand for a spade. Saunders’s affinity for the miniature started when he was a kid and would spend hours on end constructing and painting model airplanes. “When a plastic or wooden model is completed,” he says, “there’s no more work to do to it. Bonsai trees are never finished—instead of collecting dust like a plastic model, they keep getting better as they get older.” He continued this fascination into adulthood, working at GM designing models of locomotives and, later, at General Dynamics, producing an eight-wheeled armoured Stryker vehicle that the US military sent to Iraq. He quit that job after seeing his work being used in a theatre of war and started a home-based computer-graphics company. His clients have included the Hamad International Airport in Doha and sets for the Calgary Stampede. Saunders, unlike bonsai purists, sometimes crafts miniature scenes with plastic toys alongside his trees. Bonsai are often supranatural representations of trees: exaggerated, near fantastical in form, and unnaturally dramatic in shape. To achieve these iconic forms, traditional artists bend branches and secure them in place with wire. Saunders, however, prefers a technique called “clip and grow”—where a tree is pruned, left for half a year to rebound fully, and then tamed once again. He argues that to force a tree into a stylized bonsai that looks cartoonish or otherworldly—“what you think the tree should look like, not what the tree thinks it should look like”—is to miss the most powerful opportunity of the art: to transport someone out of their bubble and into a pint-sized simulacrum of the wild. Bonsai has long been an exclusive club for the knowledgeable and proficient, and not everyone reacts warmly to Saunders’s techniques. “Saunders [sic] videos are so misinformative both somewhat horticulturally and very much in technique that they’re dangerous to the practice of bonsai,” wrote one commenter online. Another called him the “Bob Ross of Bonsai,” referring to the host of The Joy of Painting, an art program from the 1980s that was geared toward amateurs. Others have called his trees “garbage” and “ugly and of inferior quality.” The comments are not exactly the most vitriolic trolling on the internet, but when Saunders lists off the insults that have been directed toward him—people calling him a “tree torturer” or proclaiming that one of his bonsai is just “a stick in a pot”—he seems to have taken them to heart. This level of attention is also why Saunders prefers to keep the town where he lives private, out of concern for his more valuable bonsai. It’s a legitimate fear: through the spring of 2015, seventy-one-year-old Tak Yamaura, a bonsai master who sold trees out of his nursery in suburban Vancouver, was the target of a string of burglaries. On six occasions within one month, thieves broke into his compound and collectively made off with about $65,000 worth of Yamaura’s most prized trees. Then the bonsai master steps forward. My tree is indeed big, Saunders says, which is fine if I have space. Some bonsai, known as imperial bonsai, are, in fact, large. A 1,000-year-old tree at the Omiya Bonsai Art Museum in Japan is more than five feet tall—though that height’s not exactly practical in my 350-square-foot apartment. Kneeling at his workbench, Saunders confirms that the issue with my tree is that it is completely out of proportion. He squints through his glasses, his eyes scanning up and down. “There is the opportunity here to start it over,” he says, chuckling. “If you want.” The importance in any bonsai, he tells me, is roots, trunk, and branches, in that order. People may focus on the canopy of leaves or the stylized branches, but Saunders says the most important feature is actually underground. I realize what I have to do. Saunders hands me a pair of “bypass pruners,” named as if they were tools for open-heart surgery. My hand trembles with worry that this won’t be a new beginning but a tragic conclusion. You have to be brave in bonsai, Saunders says. He recites a bonsai mantra, often attributed to John Yoshio Naka: “Me chicken. You chicken. No bonsai.” I take the pruners and, in one snip, decapitate my tree. I nearly yell, “Timber!” as the leafy crown I’d spent four years growing falls away from its trunk. “Done! It’s bleeding,” Saunders says with a laugh, noting the milky liquid oozing from the cut. He quickly gets to work, shaking my tree out of its pot, washing it of its soil, and splaying its roots out on the table. I feel oddly exposed. After an hour, my tree is pruned, its roots trimmed, and it’s been replanted back in its pot. My beloved tree now resembles a sad, foot-tall stump. “It won’t look the greatest for a while,” Saunders says. In bonsai terms, though, I’m not sure how long “a while” will be. A properly cared for bonsai could live just as long as some of the oldest trees in the wild, such as the millennia-old bristlecone pines found in the mountains of California. It’s possible that bonsai could even live longer, shielded from the uncontrollable forces of nature that so often end a tree’s life. While bonsai etiquette suggests that a new owner must honour their predecessors’ style and ambition for a tree, Saunders says the vast majority of bonsai do not survive being passed down. In 1970, the caretaker of the emperor of Japan’s bonsai collection, Kyuzo Murata, sold one of his prized trees—an estimated 800-year-old gnarled and twisted juniper known as Fudo—to the Brooklyn Botanic Garden, partly in an effort to protect it from the pollution in urban Japan. “I am not against progress,” Murata reportedly wrote in a letter to the BBG. “But trees do not understand it.” A year after Fudo was flown to the US, however, it died of unknown causes. The sun is setting when Saunders drops me back at the station, one short day in the long life of a bonsai over. I board the train car cradling my tree, which now looks like some weird product of logging. I’m also carrying a plastic grocery bag that reads, “Support a greener Ontario.” Inside is my severed leafy top—Saunders assured me that I can root the treetop in water to try to keep it alive. There is a future here too. To be a bonsai artist, you must look ahead. You can’t think about what your tree looks like today or what it will look like next month; you have to think about what your bonsai will be a decade from now. I sacrificed years off my tree for the hope of a better future—one of mature and proportional growth. When I reach my apartment, I place my stump on the sunny bay window. I wait, and I water. I do not worry. Two weeks later, a single heart-shaped leaf unfurls from the top.